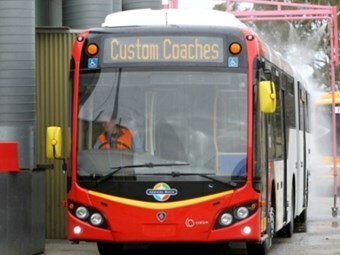 Canberra’s government-run Action bus fleet is getting an upgrade after awarding a tender to Scania and Custom Coaches to build 20 new articulated buses, coming into service from June next year. Action Buses Strategic Fleet and Capital Projects Manager Richard Matto says the first of the 20 ‘bendies’ will arrive in late June 2012 with a production run through to April 2013. Matto says the Scania articulated buses will replace the oldest of the 33 Renault bendy buses which Action has had in service for 23 years. The buses will be built at Custom Coaches’ Adelaide plant, using CB80 bodies, and driven to Canberra for pre-delivery by Scania as each bus rolls off the production line. From June next year, the Scania artics are expected to come off the line at a rate of one bus every two to three weeks until the order is filled. Although Action Buses has 33 Renault artics in service in the ACT, only 20 will be replaced due to budget restrictions. "After we go through a budget process and get approval from the ACT Government’s cabinet, we will replace the remaining 13 at a later date," Matto says. "We are not growing the fleet, we are replacing one for one." The Euro 5 diesel-powered Scanias will be disabled-access compliant, which was part of the criteria met by the winning bidder. "There was a series of criteria that was established at the front end of the tender process," Matto says. "Through an evaluation process of ‘whole-of-life’ of the bid we made a determination of what was submitted, and at the end of the day Scania came up with the best value for money." Matto says Action Buses already runs a range of Scania vehicles. "We run CNG Scania buses, and we also run 14.5 metre K series Scanias, so these will dovetail into that line of the fleet." Matto says Action decided against buying CNG-powered articulated buses in the current round. "At the moment Euro 5 standard vehicles with ultralow sulphur diesel has line ball efficiency with a CNG bus," he says. "With Canberra’s environment 300 metres above sea level, CNG performs differently to how it does down on the coast." Matto says from an emissions perspective there is no significant advantage to CNG over diesel. "CNG operates a bit more differently down on the coast, so we felt in this exercise that Euro 5 diesel was going to be our best alternative."